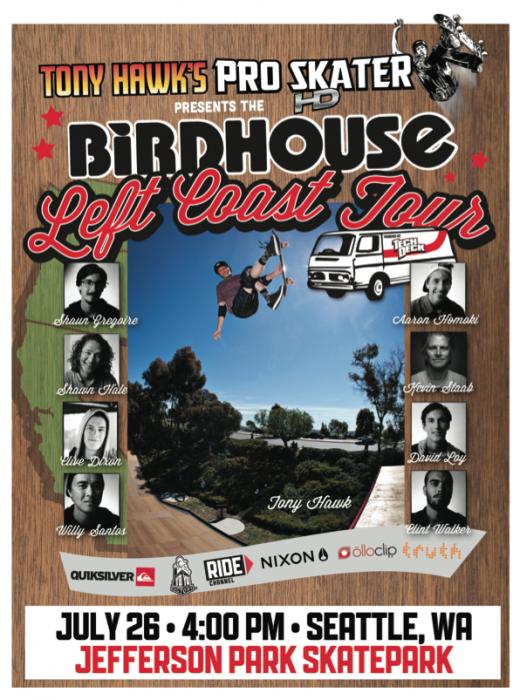 Big news for Beacon Hill skateboarders: Tony Hawk and his Birdhouse Crew are coming to the Hill for a demo of world-class skating on Thursday, July 26 as part of the Birdhouse Left Coast Tour. The event will be at 4 p.m. at the Jefferson Park Skate Park (3801 Beacon Ave. S., in Jefferson Park behind the driving range). The tour is presented by Tony Hawk’s Pro Skater HD game, which makes its debut on the Xbox Live Arcade today. So if you can’t wait until the 26th for some skateboarding action, you can keep yourself busy with the game. Previous PostP-Patchers plan party this weekendNext PostThe Beacon Hill Garden Club wants you! Tony Hawk?! No way! That is so frikkin’ cool!!! So psyched to see the man in action!